A Bargello quilt done with custom colors and design. All fabrics are 100% cotton and the batting is a black wool for breathability and use year round. The thread used was Long Staple Cotton and was completely hand guided freehand. The back that I chose for this quilt is a hand dyed Batik, and is quite lovely in itself. 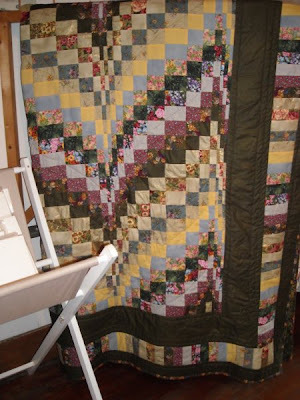 With a color range from deep green to swirls of olive and pine, it makes a nice usable 2nd side on this quilt.